Cast-iron skillets, pots, griddles and pans are becoming popular again because, when properly “seasoned,” they are naturally nonstick without added chemicals…they can be used on stovetops, in the oven and under a broiler…and once heated, they retain their heat beautifully. And high-quality cast-iron cookware costs far less than high-quality stainless steel or enameled cookware ($13 versus $95 for a 10-inch skillet). Seasoning is a process of applying oil and heat that creates a nonstick cooking surface. Some cast iron comes preseasoned. MYTH: Once seasoned, cast iron won’t rust. Reality: Cast iron must be dried thoroughly to prevent rust from forming even when well-seasoned. After drying, rub it down with a little vegetable oil or shortening. Cast iron occasionally may need to be reseasoned. This means coating the pan with a thin layer of a vegetable oil, heating it in the oven or on the stove until it starts to smoke, rubbing with a paper towel and letting it cool down. You will know it needs reseasoning when food begins to stick. MYTH: Cleaning with soap ruins cast iron. Reality: You can wash cast-iron cookware with mild dishwashing liquid. The cookware must be dried immediately and rubbed with a little oil. You even can scrub it with a nylon pad or scraper to remove food residue. One way to remove stubborn stains is to add coarse salt and a little warm water to the surface and scrub with a plastic or silicone brush. If you use steel wool or scouring powders, the cookware will need to be reseasoned as explained earlier. MYTH: If rust appears, the pan can no longer be used. Reality: If rust appears, scour the rust area with a steel-wool scouring pad. Once the rust is gone, reseason the pan. MYTH: Metal utensils cannot be used on cast-iron cookware. Reality: Metal can be used. This myth got started because when cast-iron cookware is used often, it can build up a thin layer of carbon. A metal utensil can scrape the carbon, leaving scratches and residue that look like damage. This is not the cast iron and not toxic. But to avoid this, you can use wood or silicone utensils with cast iron. MYTH: Cast iron heats evenly. Reality: Like all cookware, cast iron can have hot spots. When cooking on the stovetop, preheat cast iron for around 10 minutes, moving it around the burner to make certain that all areas are hot. It is not necessary to continue moving cast iron while cooking. 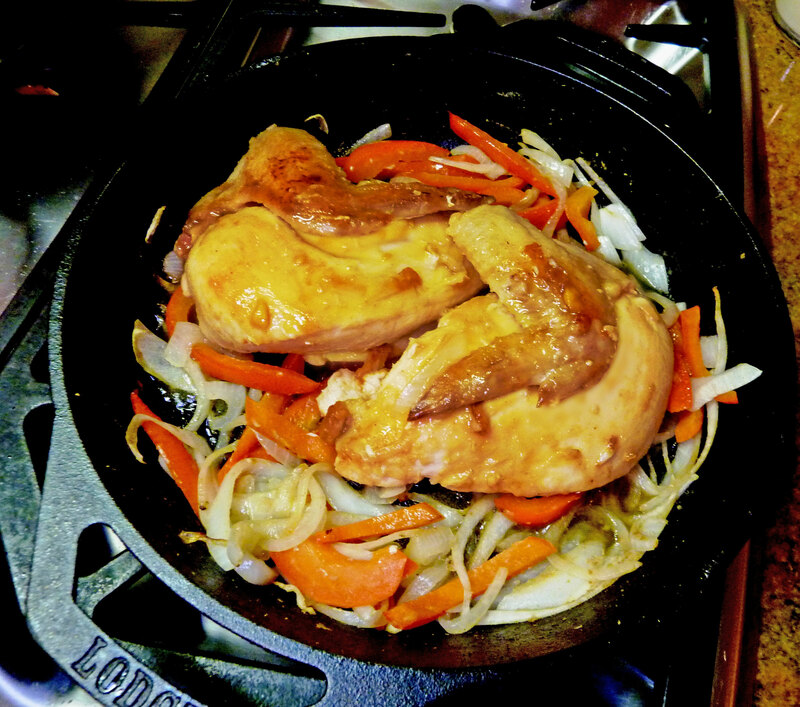 Honey Ginger–Glazed Chicken: For this recipe, the cast-iron skillet is covered with a lid. Any type of lid can be used—it doesn’t have to be cast iron. Mix the honey, mustard, ginger and one teaspoon of sesame oil, and set aside. Remove any visible fat from the chicken. Place the flour on a plate, and add salt and pepper to taste. Coat the chicken with the flour. Heat remaining two teaspoons of sesame oil in the skillet over medium heat. Add the chicken, and brown for five minutes. Turn, add the red bell pepper and onion, and cook for five minutes more. Cover, and cook for 10 minutes or until a meat thermometer reaches 165°F. Spoon the honey mixture over the chicken while it is in the pan. When serving, be sure to spoon all the sauce from the pan over the chicken. Makes two servings. 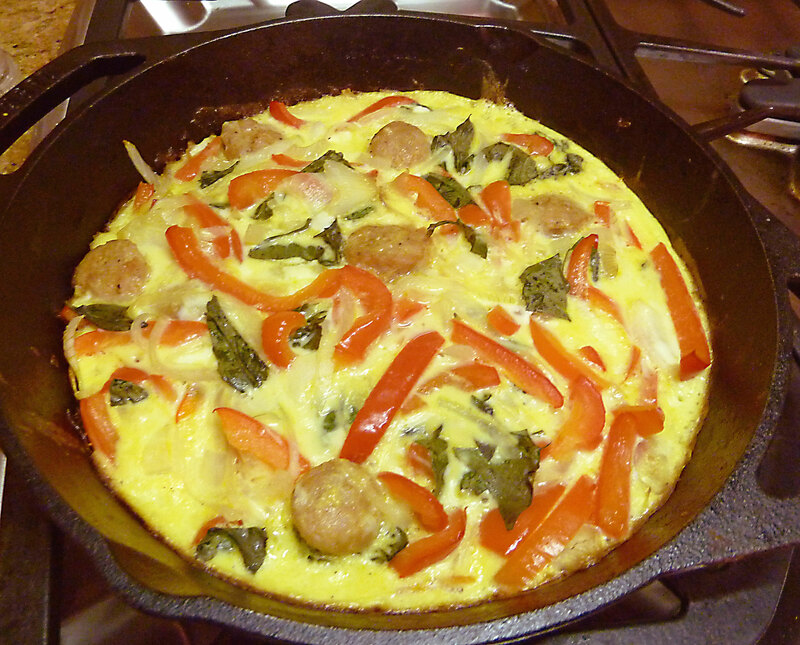 Italian Sausage Frittata: This recipe calls for the cooking to start on the stovetop and then finish in the oven. Preheat the oven to 350°F. Cut sausage into half-inch slices. Heat oil in the cast-iron skillet over medium heat. Add the sausage, ­onion and red bell pepper. Sauté for five minutes, stirring several times. Add the garlic, and continue to sauté for two minutes. Meanwhile, whisk the eggs and milk together. Stir in the basil, and add salt and pepper to taste. Pour the egg mixture into the skillet, and press the sausage and vegetables into the egg. (They will tend to float otherwise.) Cook four minutes to set the bottom of the frittata. Place the skillet on the middle rack of the preheated oven. Bake for 10 minutes or until the top is set. Remove and let rest on a rack for five minutes. Makes two servings. 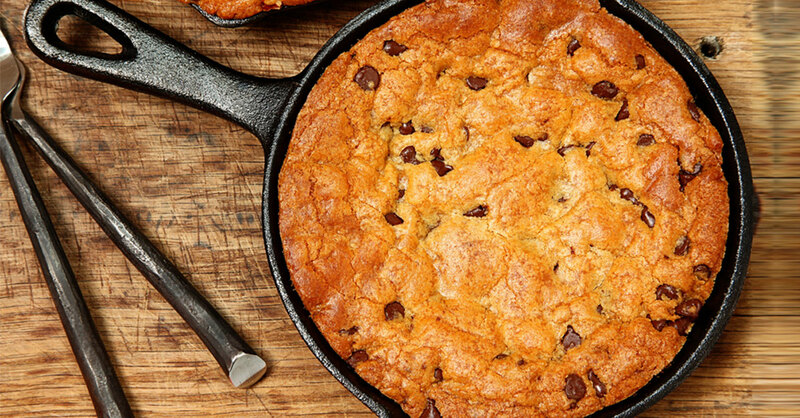 Chocolate Chip Giant Cookie: This recipe is adapted from The Lodge Cast Iron Cookbook. Preheat the oven to 375°F. Using an electric mixer, beat the two sugars and butter together until smooth. Beat in the vanilla. Add the eggs one at a time, waiting for one to be incorporated before adding the second. Remove the bowl from the mixer, and stir in the flour, baking soda and salt. Stir in the chocolate chips. Spray the skillet with vegetable oil spray. Spoon the dough into the skillet, and pat with a spoon to spread the dough evenly. Spread the chocolate sprinkles on top if ­using. Bake for 30 minutes. The edges should be golden. Remove the skillet to a rack, and cool for 15 minutes. Cut into wedges. Makes 16 wedges. Shrimp and Arugula Pizza: This recipe uses the cast-iron skillet entirely in the oven. 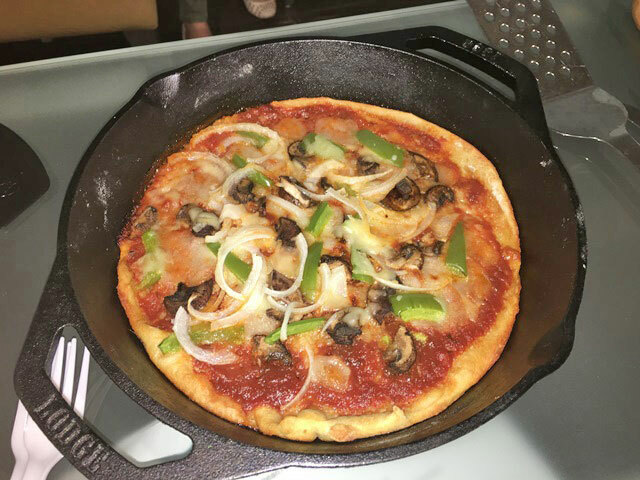 Cast iron gives pizza a crisp crust, evenly golden. Preheat the oven to 450°F. Open the ­pizza dough, and unroll it. Coat the skillet with two teaspoons of the olive oil. Place the dough in the skillet. Spread the dough about one-half-inch up the side of the skillet to account for slight shrinkage when it bakes. Cut away the excess dough. Spread the remaining one teaspoon of oil over the dough. Spoon the pizza sauce evenly over the dough, then sprinkle the cheese over the sauce. Spread the mushrooms over the cheese. Place the shrimp evenly over the top, and then sprinkle the oregano over the shrimp. Place the pizza on the middle rack of the oven, and bake for 15 minutes. The crust should be golden. Bake a few minutes more if necessary. Remove the pizza from the oven, and sprinkle the lemon juice and salt and pepper to taste over the top. Place the arugula in the center of the pizza, and spray with olive oil. Serve immediately. Makes two servings.